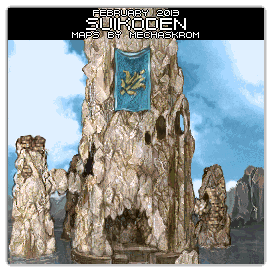 For this month's "Maps Of The Month" featurette, I wish to draw your attention to mechaskrom's Suikoden (PSX) maps. In Konami's Suikoden, you will fight against an evil empire (but really, what empire isn't evil?) after being betrayed and branded a traitor. Joining up with a rebel army, you will then recruit others for your cause; these heroes are known as the "stars of destiny". In total, there are a whopping 108 playable characters, each distinct, which is an incredibly high number for a story-driven RPG (that doesn't involve recruiting generic troops or collecting monsters). 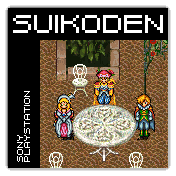 Boasting a large cast and three different types of battles, this is a unique RPG, that despite being popular enough to warrant sequels and spin-offs, the Suikoden series is still a little underrated. A PlayStation game hasn't been featured here for the Maps Of the Month in over five years! Thanks to newcomer mechaskrom, we can remedy this. Be in awe of the large overworld map! Admire the expanding layout of Toran Castle! Maximize your visits anywhere by knowing where all the treasure chests are! You've heard me rant a lot about my love for RPGs in the 16-bit era/fourth generation. The PlayStation is of the fifth generation, when polygons were relatively new on the home console scene, but thankfully there are still sprite-based gems like this one! Not too shabby, for mechaskrom's first contribution. 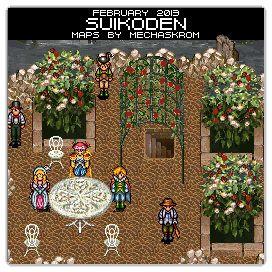 So to recognize the effort in mapping a rare 2D PlayStation game, mechaskrom's Suikoden (PSX) maps will be known as VGMaps.com's Maps Of The Month for February 2013. Thank you very much. It's a real honor to have my map awarded map of the month. Especially considering that it's my first contribution also, but hopefully not my last. Also, thank you all that helped me improve the maps by giving suggestions and etc. A keen eye may notice that there is some minor editing in between the larger and smaller thumbnails, unlike most which simply involve a basic cropping. You know, I stared straight at them and didn't even notice that they were different.